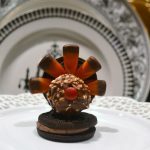 Gobble, Gobble… create this cute little Turkey Treat at each place setting for Thanksgiving Dinner. Made with hazelnut Ferrero Rocher® candy, candy corn, double stuffed Oreo ® Cookies and mini M& M’s ®. Check out the DIY How -To as seen on WJHL Morning Show. Create this cute little treat for every guest at the Thanksgiving Table. Easy to make and best part kids can help! They will love this cute and tasty treat. Separate one Oreo cookie, spread one side of cookie with chocolate frosting. Spread small amount of frosting onto the back side of each candy corn, attach to upper back of standing single Oreo to represent the tail of the turkey. Add the red M & M as the nose with a small amount of frosting. This recipe makes one turkey. Can be made ahead day before Thanksgiving. Store in closed container or wrap securely and refrigerate. Best served at room temperature. Can substitute large malted milk balls for the Rocher Candies. Frosting is the glue, so if something doesn’t want to stick or stand, use more frosting to hold in place. Once made, allow the cookie treat to sit a few minutes before moving to place setting.